The big day had finally arrived and everyone was awake at 6 A.M. Saturday morning. The power to old AHU-17 had been shut off and tagged out for demolition. The old unit had been torn down the day before, quickly, using an assortment of specialized tools, yet it seemed the hammer had gotten the most use. As the HVAC superintendant arrived with his crew, carrying two giant containers of coffee, the halls of the ICU wing were quiet. 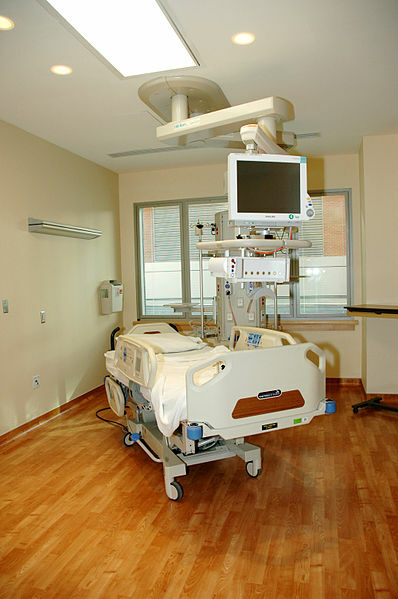 The hospital equipment was still there: patient beds, mobile difibrillators and IV bag poles seemingly abandoned throughout and covered in plastic wrap. Medical jargon, notes and nurse on-call phone numbers still lined the whiteboards, but there were no patients. They had been relocated to another part of the hospital, temporarily, while this old, rusty air handler was torn apart and a new one built in its place. During the the design of the new unit, Rita @ MonMan, the vendor, had suggested a method to keep the patients in the same wing. It involved a creative method of building a new unit in place prior to demolition of the existing unit. Luckily, there was enough space in another wing for the patients, making this project a "simple" tear out and replace. Because of the unique challenges of this work: building a new air handler in a small mechanical room with standard 3 foot doorways, with a short downtime and minimal interruption to hospital operations, word of this project had spread, and the small mechanical room was quite full of people eager to watch. There was, of course, the 6 man crew from the mechanical contractor hired to perform the air handler replacement, already working on their first cups of coffee. Several hospital representatives had found their way, escorted by the mechanical engineer who had drawn and signed the documents describing the work to be done. The field supervisors from Air Enterprises were ready, and a few team members from MonMan were there, anxious to see the new AHU-17 come alive. Despite all the planning and preperation, the entire schedule was nearly thrown off, when, during the demolition, portions of the existing ductwork were found to be too dirty to reuse. It seems that, upon removing the old unit the night before, the supply and return duct connections were found to be contaminated with some of the blackest and greenest fuzz you've ever seen. In a scene that had been played out countless times before in that ICU surgery suite, a few skilled technicians removed the ailing arteries and replaced them with brand new, clean sections, completely smooth on the inside. The only difference is these arteries would soon be pumping the lifeblood that powered the enitre surgical suite: fresh, clean air. With their first contingency well resolved, the team had a brief kickoff meeting, and the new air handler project began. 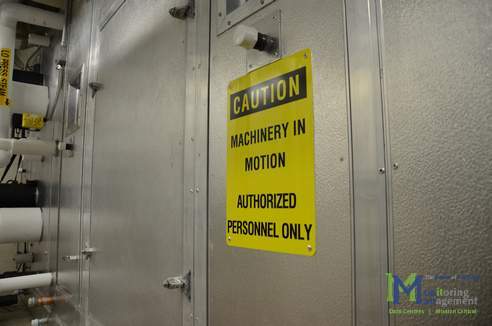 Since the mechanical room in which this new AHU would be built was barely large enough for the unit plus a few technicians to work, some of the components were pre-assembled in the makeshift staging area outside the 3 foot doorway into the room. The welded, aluminum base was assembled first on the concrete houskeeping pad. Although the base was stout, thick and beefy, its lightweight aluminum design made it easy for only a few technicians to handle. Base sections were joined and sealed together. Next, the first wall panels were put into place, joined and riveted. The wall panels soon stretched around from the rear of the unit to the sides: the unit was already taking shape. While work on the outside of the unit was progressing, workers soon began work on the inside: assembling the framework that would soon house the cooling coil. By 11 A.M., before the workers had a chance to break for lunch, the stacked coil had been lifted into place inside the unit. To a lay onlooker, it would be hard to tell what these technicians were doing to this shiny unit. Were they fixing it? Tearing it apart? Building it? Its "guts" were exposed for all to see. But to everyone in that room, it was an amazing sight: A new air handling unit was being built right before their eyes! Most of the personnel who didn't have to be there, had already left for lunch and to leave the install technicians to their work. As work progressed on the outside of the unit, work began inside, assembling the support structures for what would soon hold a humidifier, UV light assembly, fans and filter racks. Each panel, base section and component was specifically designed to not only fit through the smallest choke point (a 3 foot door), but to build a complete AHU providing 24,000 CFM of HEPA-filtered, humidified and UV treated air. The fan/motor assemblies were rolled through the door and hoisted into place. By 5 P.M., before the end of the first shift, the fans were mounted on their vibration pads. After a quick briefing, the second shift began working on the remainder of the outer panels and the reaining interior components. Work progressed through the night, leaving little to be done on day 2. The team was ahead of schedule, calming the fears anyone might have had about getting the air handler replaced quickly. By Sunday morning, the end of the first 24 hours, the exterior of the unit was complete, as well as all major components inside the unit. All that was left was to pour the expanding foam into each channel and joint of the unit, and finish up the piping and electrical connections. Most of the workers were sent home early, since they had installed the unit well ahead of schedule. A few grumblings could be heard about not receiving more overtime and wondering if perhaps they worked "too quickly." On Monday morning, several groups of officials, from the hospital, engineering firm and contractor, were sorely disappointed, arriving first thing Monday morning to a complete unit. They had hoped to catch the unit construction somewhere at the midway point, but the unit went together so well that the entire project was moving along faster than predicted. One of the hospital officials asked the project manager from MonMan for an update; they replied: "The entire project is going well! Initial startup of the fan motors is underway, and full commissioning of the unit will begin this afternoon. It looks like we are well ahead of schedule." Ben, the energetic Energy Specialist overheard this and stood there, with his arms crossed, proud of the new unit. Walking over to James, the gruff supervisor who had doubted such a unit build would work in a confined space, Ben said "Well, they sure figured out how to get this new unit through the door in a hurry!" James shrugged his shoulders and humphed "Well, I told you it would work." Ben's mouth curled up at the corners in a wry, proud smile. Not wanting to argue that it was his idea in the first place, he simply said "Why yes, you did. And it looks great!" No word on the angry badgers.